Have you ever wanted to get your students to really understand musical symbols? This module contains three fun types of worksheet – which are completely different to traditional music worksheets. 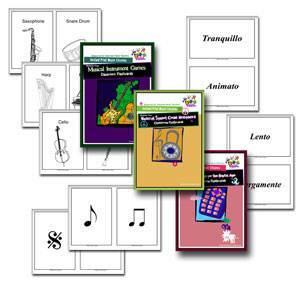 Music Theory Fun Sheets do not attempt to teach the topic – however they greatly assist in improving the retention of the concepts that have been taught. Music is a complex language. Not only do we have to learn the technical aspects of performing an instrument we have to learn pitch and rhythm simultaneously, and we put a piece of music with many different strange looking symbols in front of students and expect them to remember what they all are and what they all mean. 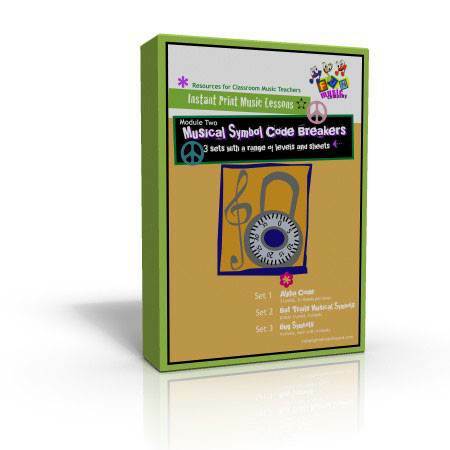 Musical Symbol Code Breakers aims to help with students retaining the knowledge of basic musical symbols. Nothing more, nothing less! Are great fun – your students will ask again and again for more! – and luckily each module has enough to choose from to make it easy and fun to choose something right for every level. 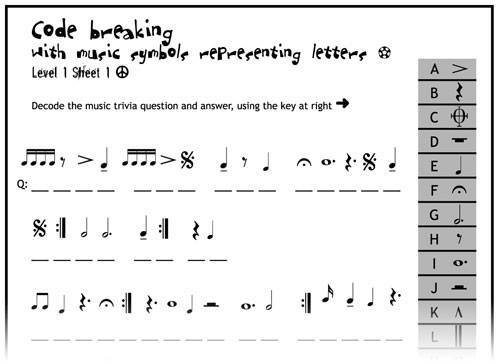 Like in Module One, each worksheet features a piece of music trivia – Including items from both popular and Classical music. What’s the difference between the look of a Quaver and a Semiquaver? What does a Coda Symbol look like, and what does it mean? What’s the difference between the dot on top of a note, and a dot to the side? Set one has three levels, each with three or four sheets (there are 10 worksheets in total in the set). 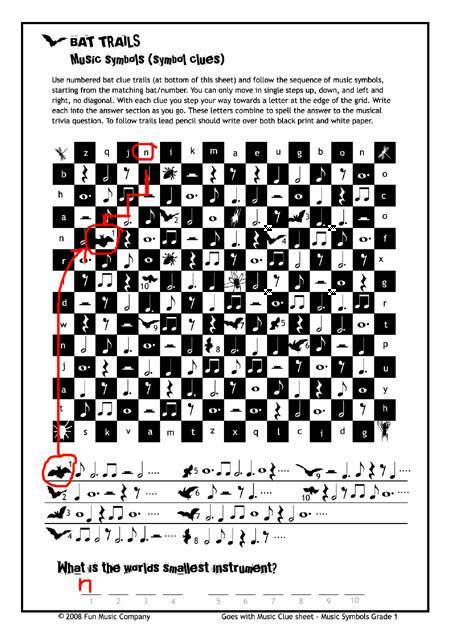 In levels One and Two the students familiarize themselves with the look of the symbols by using them to match up the key on the right hand side of the page. This means that this worksheet requires little or no preparation beforehand – it could easily be used by a relief or substitute teacher – or for a fun activity when students have finished other work. In Level Three, the symbols are taken away, and replaced by their names. This means that students have to identify the symbols from their names only. As with all the modules in Music Theory Fun Sheets you do not have to do every single worksheet – There are this many different variations so that you’ll be able to choose a level that is right for each and every class. And If they ever get bored with those ones…. 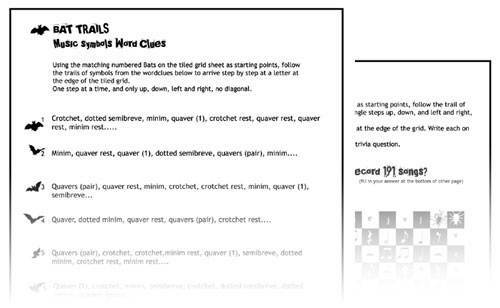 Bat Trails Features Four Worksheets using a different idea. In bat Trails students will follow a trail of musical symbols in a tiled grid to reach a letter at the edge. Like in Alpha Code, Sheets One and Two don’t require students to know the names of the symbols – they just rely on the students being able to identify the differences between them. 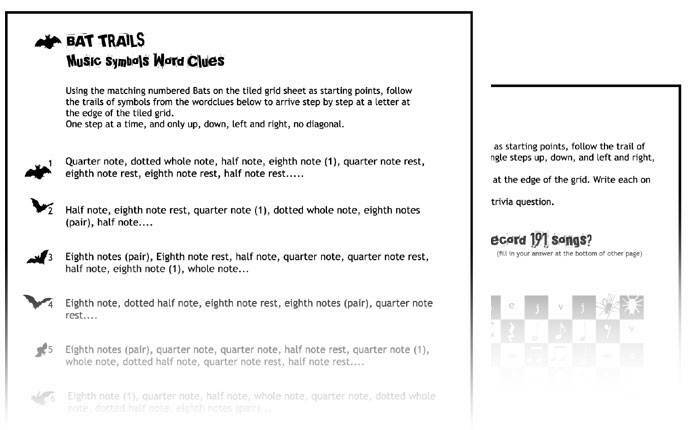 This way the first two worksheets of this series can easily be done by a class without a music specialist even being present. In sheets Three and Four of “Bat Trails” students have to find their way through the maze of symbols using only the names of the symbols, and they need to know what each symbol looks like in order to solve the puzzle. 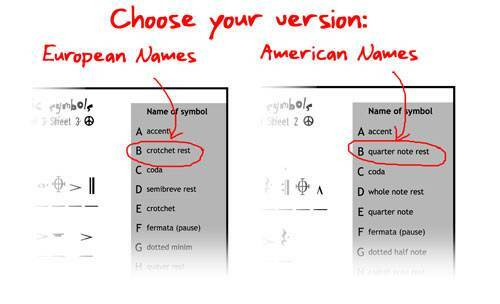 And once again we have provided version for both European Time Names (as above) And American (as below). 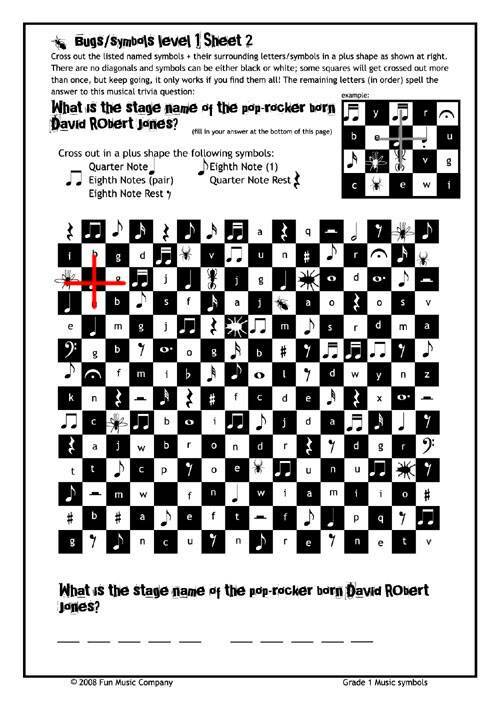 In Bug Symbols students cross out symbols in the grid using a plus shape, and once they’ve found every instance of the symbol and crossed it out in this way they’ll be able to find the answer to the trivia question. This sounds simple – but it isn’t! Students have to find every instance of the musical symbols, and be able to identify small differences in them. Set of Classroom Sized Flashcards to match the musical symbols. 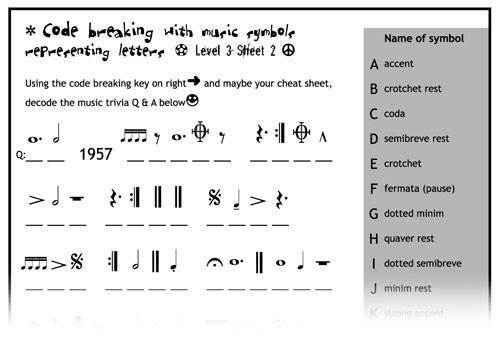 This set of 32 flashcards (16 Pages) contains all the common symbols used in Music Theory Fun Sheets Module Two (Musical Symbol Code Breakers). 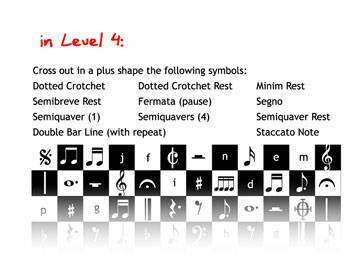 It includes the basic note types such as Crotchet or Quarter Note, Minim or Half Note, and all their corresponding rests, as well as articulation symbols such as staccato and legato, accents, coda markings and basic clefs. It is not comprehensive by any means, but it does contain all the basics that students need to know and be familiar with to succeed in reading music. There is deliberately no names written on the cards, so that they can be used for guessing games and so they can be used with either European or American Terminology. I know that we’ve already said it above, but I think its worth restating that we’ve gone to great lengths to provide two distinct versions of the worksheets, whenever required. If your students are used to using European Terminology (crotchet, quaver) etc then it can be quite confusing if materials are presented with American (Quarter Note, Eighth Note). We’ve also provide all the answers to the trivia questions, so if you get stuck you’ll always have a reference! Answered versions for each worksheet – Makes sure you won’t be caught out! priceless! “Music Education News” The Fun Music Company Monthly e-newsletter Priceless! Great Value for Music Teachers…. So, for around the cost of one CD you’ll have access to over 25 worksheets that you can use time and time again, in many and varied teaching situations. To create just one of these worksheets would take you at least two hours, so you can look at it that even if you just use five of them you are saving yourself many hours work in lesson preparation!